A Death Knight is not pleased with your intrusion. 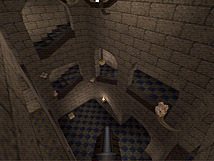 The many levels of the castle fortress. Moonlight Assault is the second single player effort by Kevin Shanahan. If you like a medieval castle setting for your Quake I gaming pleasure then read on. Kevin has packed a whole lot of gameplay in this convenient single play .bsp file. 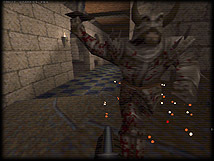 Don't be fooled into thinking that you won't get a lengthy Quake experience with a single .bsp either. You will simply not believe how large this castle installation is. But we all know that a large file means nothing if the gameplay is not up to snuff. Thankfully Moonlight Assault is even larger on gameplay. Pacing is everything and you will not find a better example of a build up in gameplay than what Kevin has created here. The battles get more intense and the enemy tougher as you get further into the level. By the end you are fighting furiously just to stay alive. The layout of the castle is well done too. With some button pushing and a key and rune to access you have a few tasks to concentrate on as you fight your way through to your next objective. There are several areas that you can see but can't access until later. Winding your way to other parts of the castle and then looking down on previously explored areas is always appealing and shows a bit of planning in design. 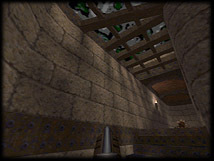 Kevin has created a fine medieval Quake I game play experience here. Yet another reason to keep Quake I installed on your hard drive. Well paced gameplay, large and interesting castle build. Medieval Castle map with all the right stuff. Looks good, plays great.